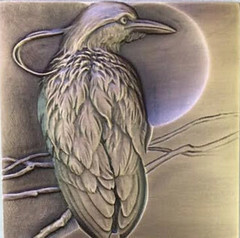 The 2017 Brookgreen Medal was designed by Heidi Wastweet of Albany. CA. selecting "Flora and Fauna of the Southeast" as the medal's theme. This is the first square-shaped medal in the series. On the obverse, a Black~crowned Night Heron is shown from the back, its head turned to the right, perching on a slender branch. The concavity in the upper-right quadrant, behind and beside the bird's head, suggests the moon. The reverse depicts a perching bird, a leafed branch overhead, looking downward to the left with its wings lifted about to fly. 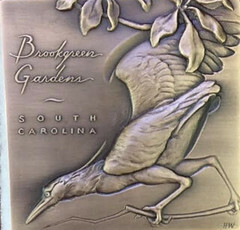 The words, Brookgreen Gardens, in script, suggesting lettering from an artist's sketchbook, and South Carolina, in block letters, are in the upper-left quadrant of the design. During the sculptor's 2015 residency at Brookgreen Gardens, she enjoyed photographing and sketching these birds in the Cypress Aviary of the Lowcountry Zoo. She says: "1 love bas-relief for its perfect marriage of the tactile nature of sculpture with the illusional qualities of drawing. It can depict effects such as shadow, transparency, and atmosphere, which are not usually attributed to sculpture.